Apples in Dawn and Larry’s yard. Vermont is showing it’s glorious artistry right now. 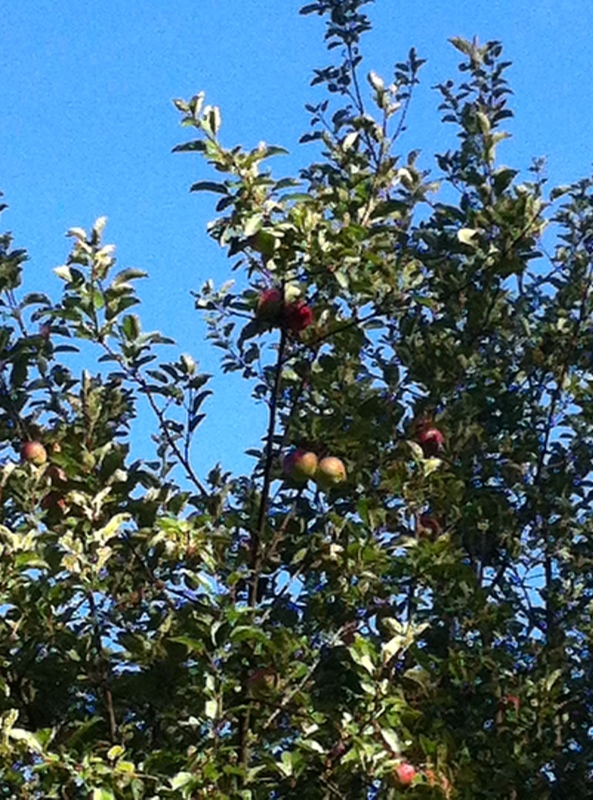 And part of September’s beauty includes orchards full of bursting, heavy, snap-crisp apple trees! Having just made a big batch of applesauce, and with this weekend’s agenda including pressing some apple cider, (both of which we will delight in during the darker days of February) I thought I’d share a few apple facts. *The science of apple growing is called pomology. *Apple trees take four to five years to produce their first fruit. *Apples are a member of the rose family. *Most apples are still picked by hand in the fall. *The crabapple is the only apple native to North America. *Apples come in all shades of reds, greens, and yellows. *Two pounds of apples make one 9-inch pie. 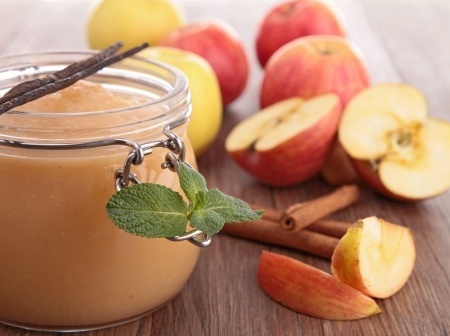 Fresh apple cider can be frozen and later enjoyed in the cold winter months. 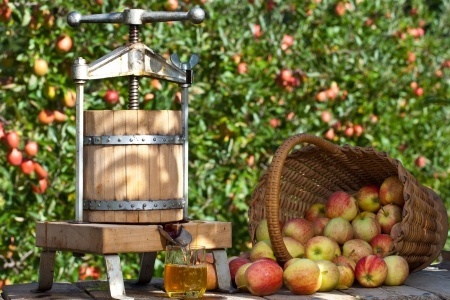 *It takes about 36 apples to create one gallon of apple cider. *About 60 percent of the U.S. apple crop is consumed fresh. *Red Delicious is the variety with the greatest production in the U.S.
*The top U.S. apple varieties are Red Delicious, Golden Delicious, Gala, Granny Smith, Fuji and Mcintosh. Vermont’s leading apple varieties are McIntosh, Cortland, Red Delicious and Empire. McIntosh apples became the state’s leading variety after an extremely cold winter (1917-1918) devastated most other varieties. In 1999 The Vermont legislature designated the apple as the state fruit, and the apple pie as the state pie! *The average family consumes about 19 pounds of fresh apples each year. *The average American eats just over 4 pounds of canned apples and about 1.7 gallons of apple juice annually. *Around the world, apple growers grow over 1 billion bushels of apples. *Largest apple producers (in decreasing order) are China, United States, Italy, France, Poland and Germany. *The pilgrims planted the first United States apple trees in the Massachusetts Bay Colony. *Apples were the favorite fruit of ancient Greeks and Romans. *The largest apple picked weighed three pounds. *It takes the energy from 50 leaves to produce one apple. *Apples are the second most valuable fruit grown in the United States. Oranges are first. *In colonial time, apples were called winter banana or melt-in-the-mouth. *Apples ripen six to ten times faster at room temperature than if they were refrigerated. *Don’t peel your apple. Two-thirds of the fiber and lots of antioxidants are found in the peel. Antioxidants help to reduce damage to cells, which can trigger some diseases. *A medium-size apple weighs 5.5 ounces. *A medium-size apple (fresh, raw, and with skin) has only 80 calories, no fat, no sodium and no cholesterol. *Cornell University researchers have found that 100 grams of unpeeled fresh apple (about 2/3 of an apple) provides the total antioxidant activity of 1,500 milligrams of vitamin C.
*Researchers in Finland reported in the May 2000 issue of The European Journal of Clinical Nutrition that individuals who ate the most apples had the lowest risk of thrombotic stroke, possibly due to phytonutrients found in apples. *British researchers have found that apple eaters have better lung function than non-apple eaters, as reported in the January 2000 journal, Thorax. *Epidemiologists from Finland’s National Public Health Institute found that consumption of a flavonoid-rich diet (including apples) was associated with a reduced risk of developing cancer. Core and dice apples; place in saucepan, add water and salt, simmer until soft. Press through sieve or food mill; add cinnamon, salt, lemon juice and add sugar to taste; stir until dissolved. Serve hot or cold. This entry was posted in Vermont Bicycle Tours and tagged adventure, Apple, apple cider, apple orchards, apple trees, applesauce, bicycle, bicycle tours, bike, bike touring, biking, Cornell University, cycling, Discovery Bicycle Tours, fall in Vermont, Granny Smith, inn-to-inn bicycle tours, List of apple cultivars, Mcintosh, orchards, Red Delicious, United States, vermont. Bookmark the permalink.